The guard tour system of the present invention is comprised of a central computer which runs a computer program that enables a variety of electronic hardware components to function as the guard tour system. As a guard progresses through a guard tour, he or she uses a touch button reader to read information stored within a plurality of touch memory buttons located along the patrol route. At the end of the patrol, the guard places the touch button reader in a downloader that transfers the stored data to the central computer which processes the data and generates reports summarizing the patrol data. The computer program of the present invention provides a novel method of organizing security information in hierarchical categories. Further, the guard tour system of the present invention uses a novel method to determine the number of times a guard visited a location in a given time period. It helps ensure that the employee makes his or her appointed rounds at the correct intervals and can offer a virtually indisputable record for legal or insurance reasons. Such systems have existed for many years using mechanical watchclock-based systems (watchman clocks/guard tour clocks/patrol clocks). Computerized systems were first introduced in Europe in the early 80s, and in North America in 1986. Modern systems are based on handheld data loggers and RFID sensors. Essentially, the system provides a means to record the time when the employee reaches certain important points on their tour (and, of course, the fact that they reached these points at all). Watchstations are commonly placed at the extreme ends of the tour route and at critical points such as vaults, specimen refrigerators, vital equipment, access points, etc. Some systems are set so that the interval between stations is timed so if the employee fails to reach each point within a set time, other staff are dispatched to investigate and ensure the employee's well-being. 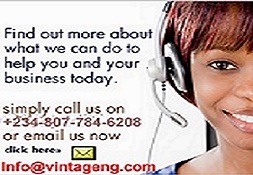 Vintage Technologies has been supporting small businesses in the Nigeria, with clients across a variety of business sectors including education, hotels, real estate and healthcare. At vintage Technologies, we are very familiar with the securtity threats that are very challenging to the security welfare of individuals with regards to our environment. 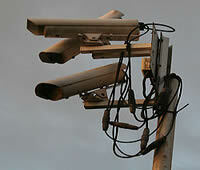 And as such, Vintage Technologies has proven to be the best CCTV security surveillance firm in the country. We specialises in the implemenatation of alarm system that includes a number of alarm detecting devices wherein each alarm detecting device includes an alarm condition detecting circuit, a secondary alarm activation circuit, and an audible alarm output circuit including an audio oscillator and a speaker; the audible alarm output circuit being responsive to a detecting circuit control output generated by the alarm condition detecting circuit and to a secondary triggering output signal generated by the secondary alarm activation circuit; the secondary alarm activation circuit including a microphone having a microphone output signal, an amplifier circuit in connection with the microphone output signal and generating an amplified output signal, a filter circuit having a filter input in connection with the amplifier output signal generating a filtered output signal in a first predetermined frequency range; a filter signal integrator having an integrator input in connection with the filtered output signal for integrating the filtered signal output and generating an integrated output signal; a reference signal generator having a reference signal output; a comparator circuit having a reference signal input in connection with the reference signal output and a compared signal input in connection with the integrated output signal, and generating the secondary alarm triggering output signal when the compared signal input exceeds the reference signal input. Remote surveillance is commonly used to describe observation from a distance by means of electronic equipment or other technological means. However, surveillance also includes simple, relatively no- or low-technology methods such as direct observation, observation with binoculars, postal interception, or similar methods. We help organisations make sure they are not leaving themselves exposed to unnecessary and excessive business risk as well as the inevitable financial pitfalls. I use Vintage Technologies for the maintenance and support of our own server and office systems. Whenever I need any help or support they are always there to assist and fix any problems. My business runs on our IT systems and Vintage Technologies are always there for us.